Ian Stannard returned to the Tour of Flanders two years after his debut to work for Sky team leader Juan Antonio Flecha. Flecha failed to come away with the win, but Stannard gained experience over the Belgian roads. “I don’t remember too much from last time because I was suffering too much,” Stannard told Cycling Weekly. I was suffering so much last time, but this time I am with a much bigger and better organised team. We have jobs to do in the race rather than just ride around. Before the final kilometres, Stannard worked at the front of the main group to control the eight-man escape that rode free immediately into the race. He and fellow Brit Geraint Thomas led the main group with Sky’s Kurt-Asle Arvesen and Mathew Hayman. Sky’s work kept Flecha near the front over the first of the day’s fifteen climbs. 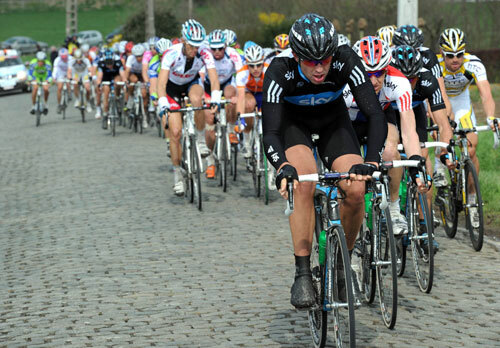 Flecha was in position when the group began to splinter on the Paterberg and the Koppenberg climbs. Flecha eventually missed the winning move with Fabian Cancellara and Tom Boonen on the Molenberg and remained with his rivals 30 kilometres later when David Millar went on the attack. “I don’t know what happened to Flecha in the end,” Stannard said. Spaniard Flecha finished 34th, 2’35” back behind winner Cancellara. Stannard finished 84th, 13 minutes back. “For me the race went pretty well. I was at front with the days and everything went perfectly,” Stannard continued. Stannard passed the last two years with smaller teams. After a stagiaire period with T-Mobile, he turned professional with Belgium’s Landbouwkrediet team in 2008, when he had his first taste of the cobbles. He rode the Tour of Flanders, Gent-Wevelgem and the Paris-Roubaix. He raced with ISD last year in Italy before making the step up and joining Team Sky for this season.